I am a lover of everything beauty related, but one of my favorite beauty products are makeup brushes. You could say I am a makeup brush hoarder, because I have probably too big of a collection for someone that doesn't even work as a makeup artist. I think makeup brushes make all the difference. 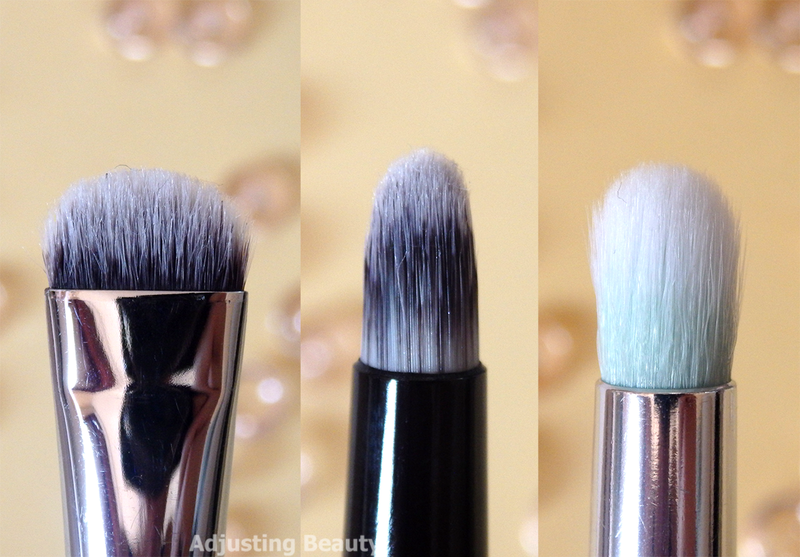 You can have low quality makeup products, but if you have good brushes, you can still make it work. The other way around, I don't think so. 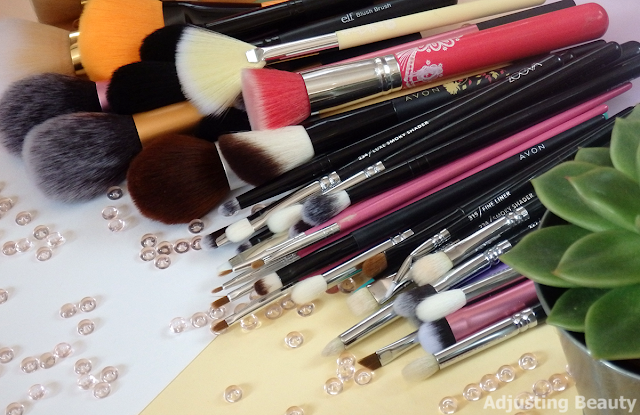 In this post I've collected my favorite makeup brushes for each part of the face. I'll also tell you for what part I use each brush. By no means, you need that much brushes to create a good makeup look, it's just what I've accumulated over the years. 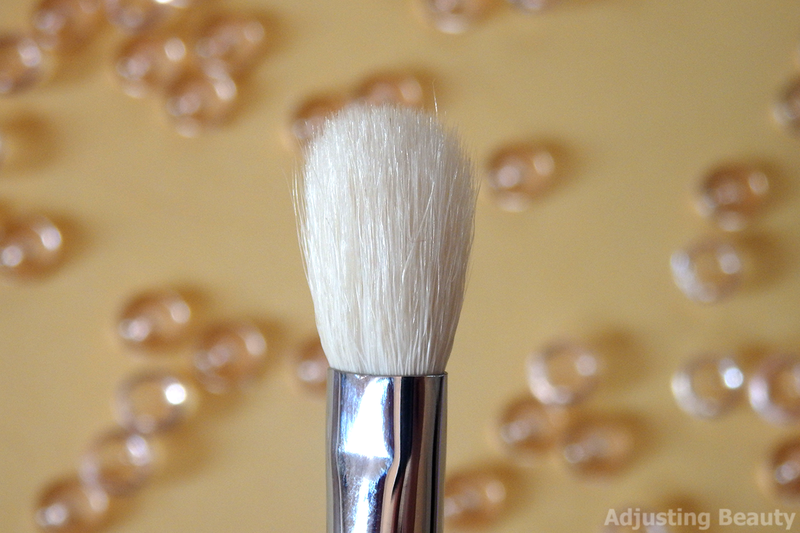 I mostly use Ebelin Makeup Sponge for my foundation routine, but sometimes I also use a brush. For that I love flat dense brushes. These really buff foundation into the skin and make it look like it's part of your skin. 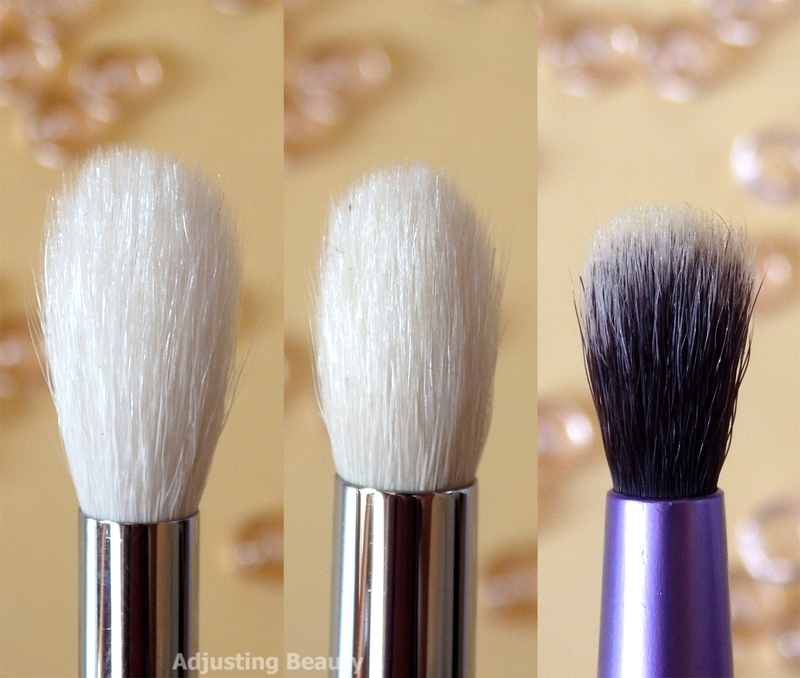 I also like these brushes, because they can help you thin out your foundation, if you use small amount of it and really work it into the skin. 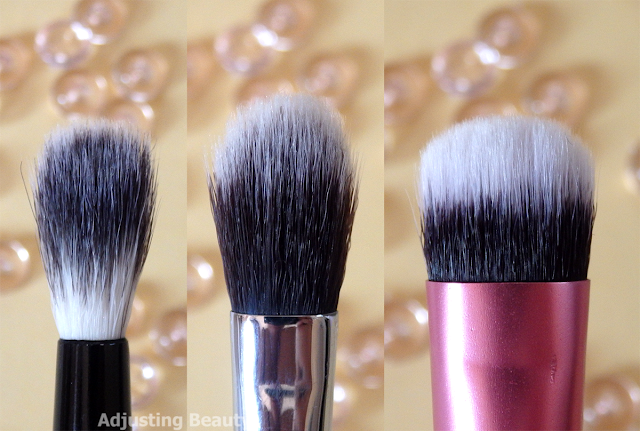 My favorite foundation brush is Essence LE Bloom Me Up! Blush Brush. 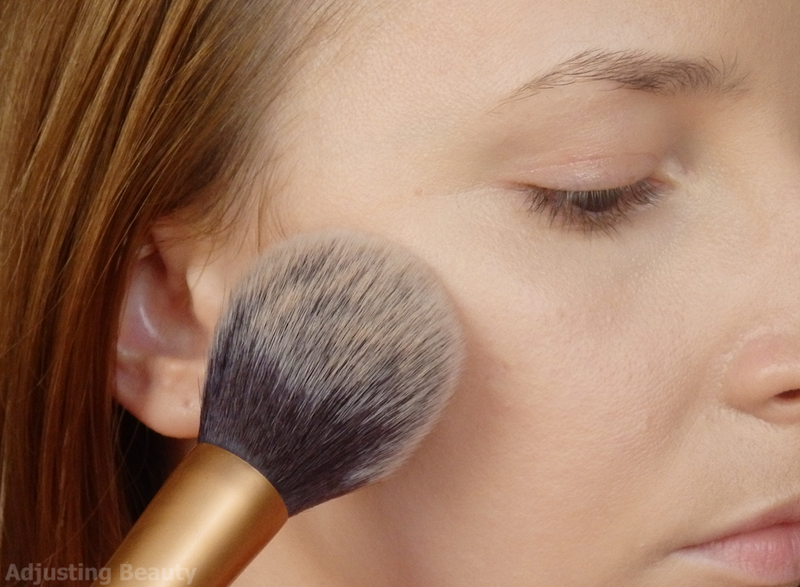 I don't understand why it's called blush brush, because it looks perfect for foundation. I like that it has soft and fairly dense bristles and it does a nice job of blending out foundation. For concealer I love to use multiple brushes. They vary from short and wider brushes to really precise pointy ones for pin point concealing. 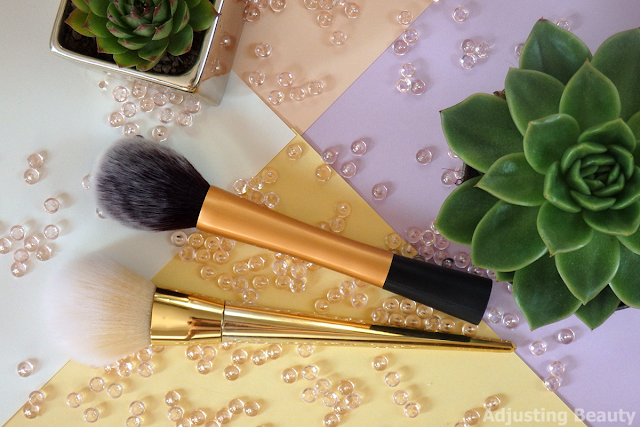 Avon Concealer Brush is my favorite for brightening up my under eye area. I have prominent lines under my eyes, which I love to brighten up. I do that with a light creamy concealer and I apply it directly onto the hollow under my eye to brighten up that shadow. It has a perfect shape for that. 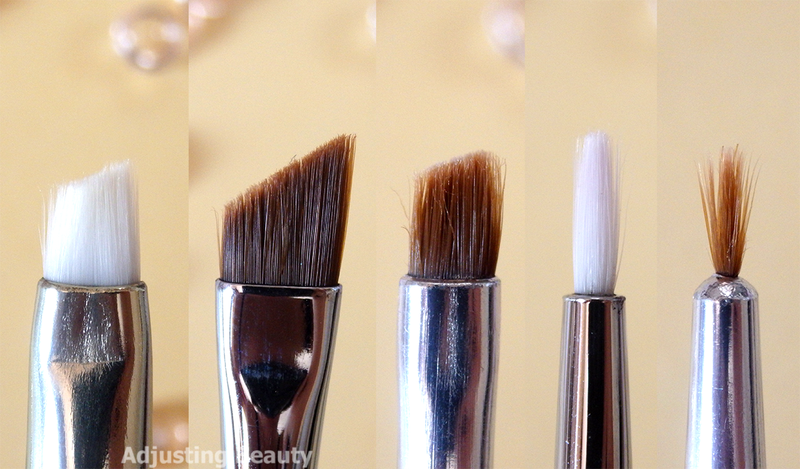 For a more precise concealing, like covering beauty marks, pimples and such, I love to use smaller pointier brushes. For that I prefer to use a few of nail brushes. Yes, you heard it right. These pink ones are from a nail kit and they are perfect for precise concealing. I also have different sizes of powder brushes. Sometimes I go all in with powder and sometimes I just want to place it on my oilier parts. 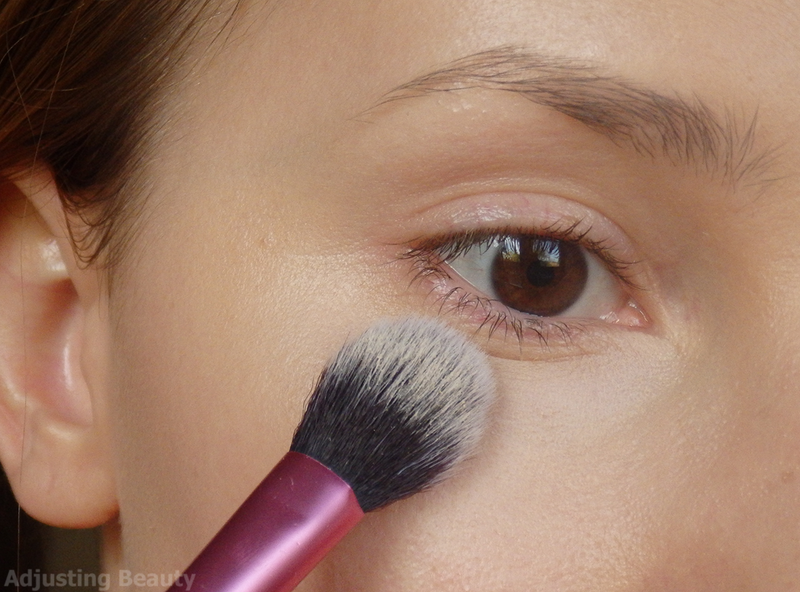 Recently I've also started using different powder underneath my eyes, so I use smaller brush for that area. 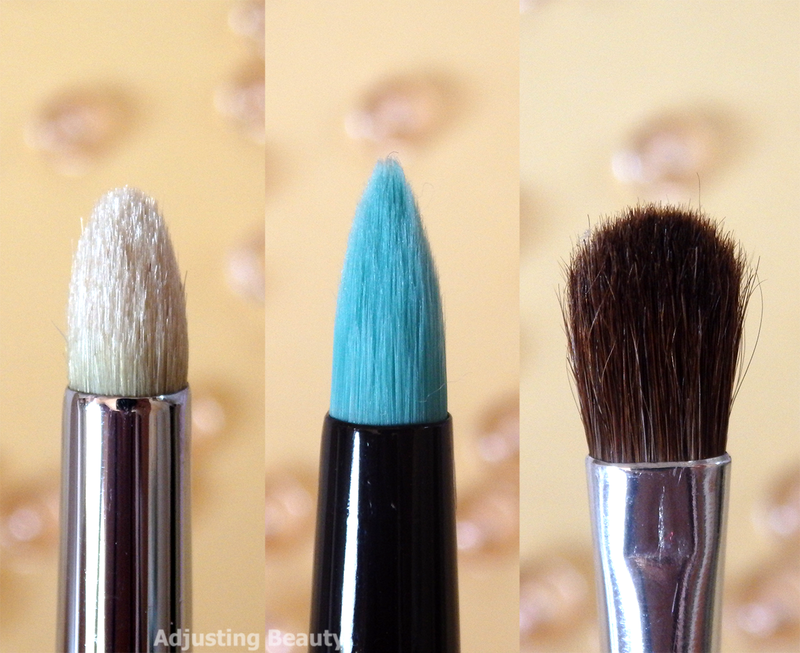 Real Techniques Setting Brush is perfect to use underneath the eyes. It's just the right size and it doesn't pick up too much product, because it's tapered. It has longer and shorter bristles, which blend the product really well. Ecotools Bamboo Tapered Blush Brush is one of the best quality makeup brushes. It has a tapered shape and it's a bit flat from the side. This makes for a perfect sized powder brush. I use it when I want to apply powder all over my face. I don't like too big brushes, but this one is just big enough. Bristles are super soft. E.l.f. Blush Brush is again perfect for powder, but for smaller areas. 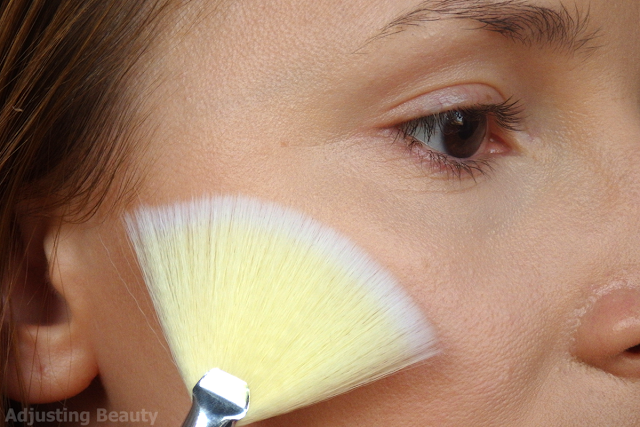 This is great for when you want to powder only smaller areas, like your T-zone. 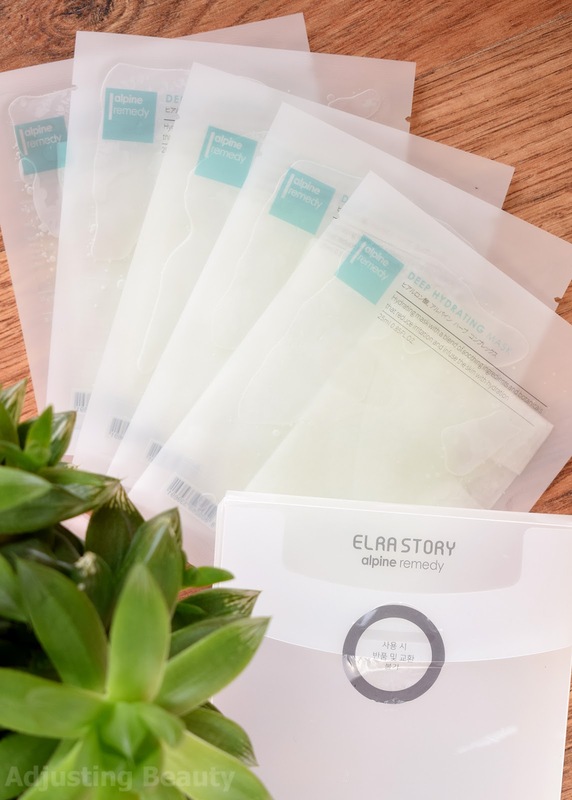 It also has tapered shape and it's flat from the sides, so you can lean it against the skin and just slowly tap powder on the skin. Bristles are again really soft. This is one of my all time favorite E.l.f. brushes. Bronzer brushes are usually really big. I like those too, but mostly for summer or when I want an all over sun kissed look. 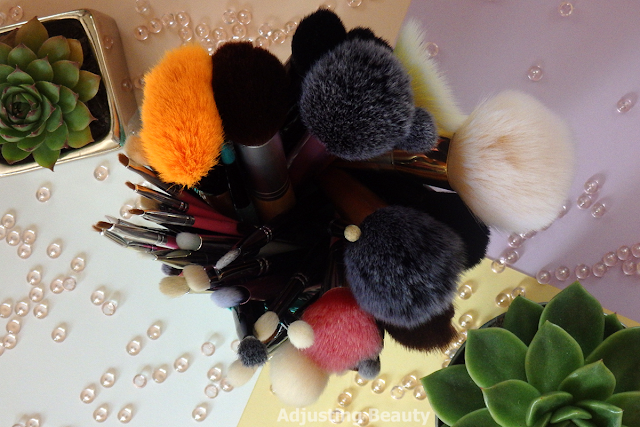 I also love to use a bit more tapered brushes, especially when I want to apply bronzer only on the outer parts of my face and be more strategic with it. Sometimes I like to apply it in a contoured shape to bring out cheekbones and make them look higher. 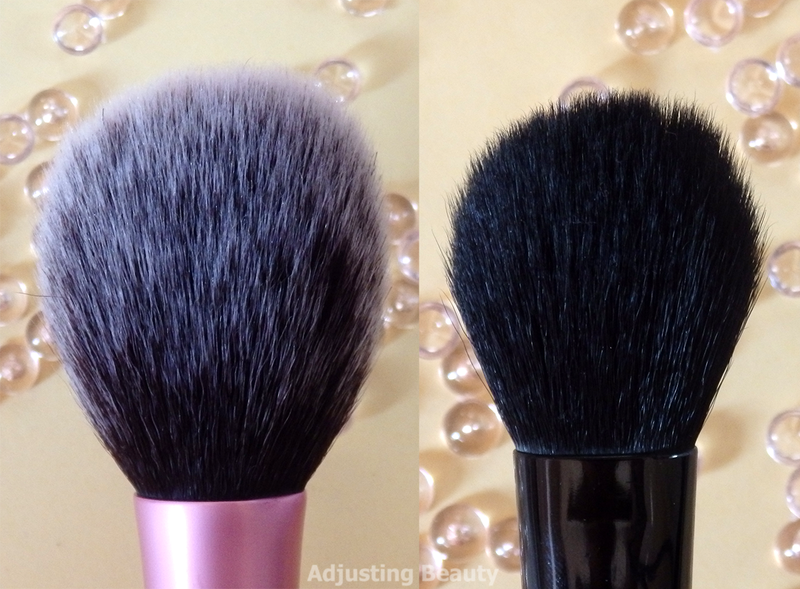 Ebay Blush Brush (Real Techniques Blush Brush Dupe) is perfect for applying bronzer in a softer and more precise way. 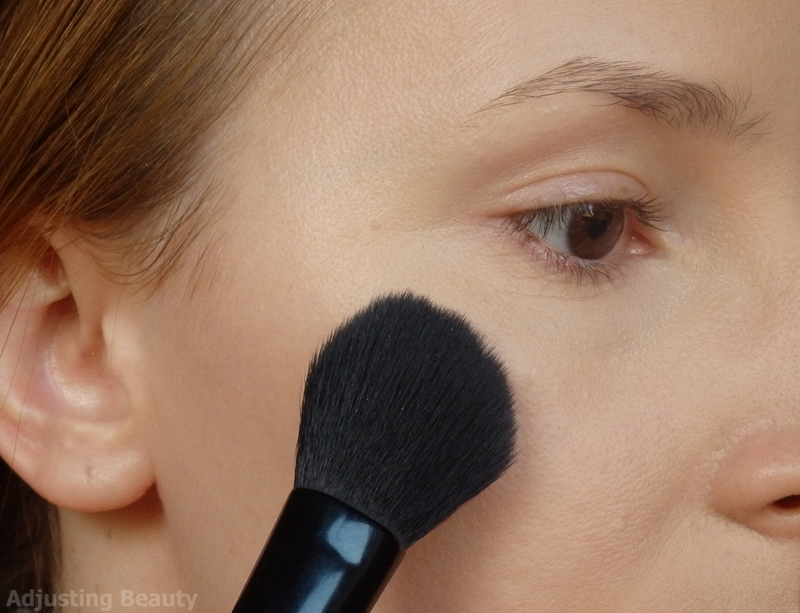 I love to also contour a bit with my bronzer and apply it mostly on the very outer parts of my face. This gives me precision. 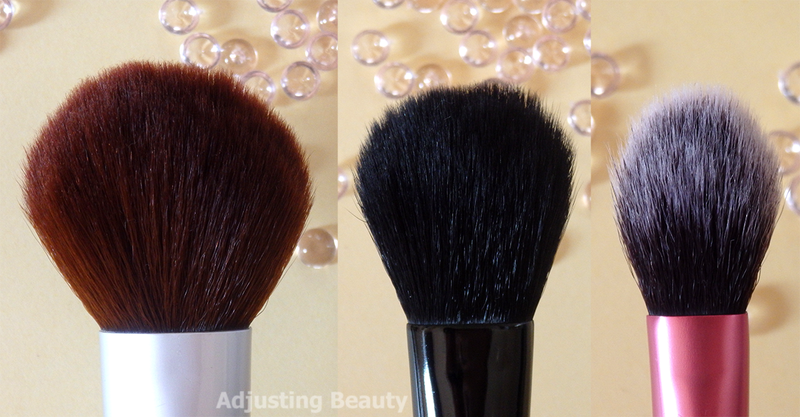 Bristles are extremely soft, tapered and they blend product perfectly. Ebay Metallic Powder Brush is for those days when I want to go crazy with bronzer and lightly apply it all over my face for that sun kissed look. It's a bit bigger, has really soft bristles and is also a bit tapered and rounded. It blends well and doesn't pick up too much product, which I like. Especially with bronzer you can quickly go overboard. Some like their blush wide and strong and some like it applied only on a certain spot. I do a bit of both, depending on what look I want to go for. E.l.f. 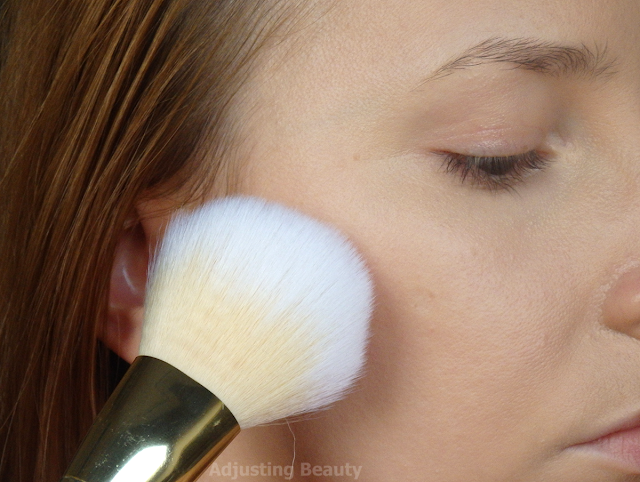 Blush Brush is also perfect for blush. I have two of them, one for powder and one for blush. 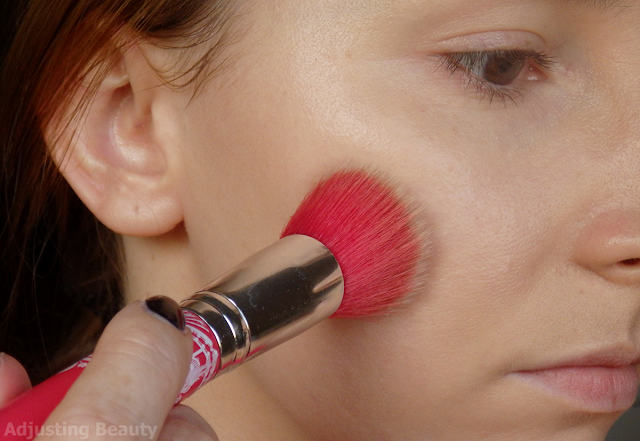 This is the perfect size for applying blush. It fits exactly on to the highest point of cheek. I love that I can apply blush really precisely only to an area that I want. It blends it just enough and it doesn't spread it all over the cheeks. Bristles are tapered and really soft. I build it up slowly, because some pigmented blushes can easily look heavy. 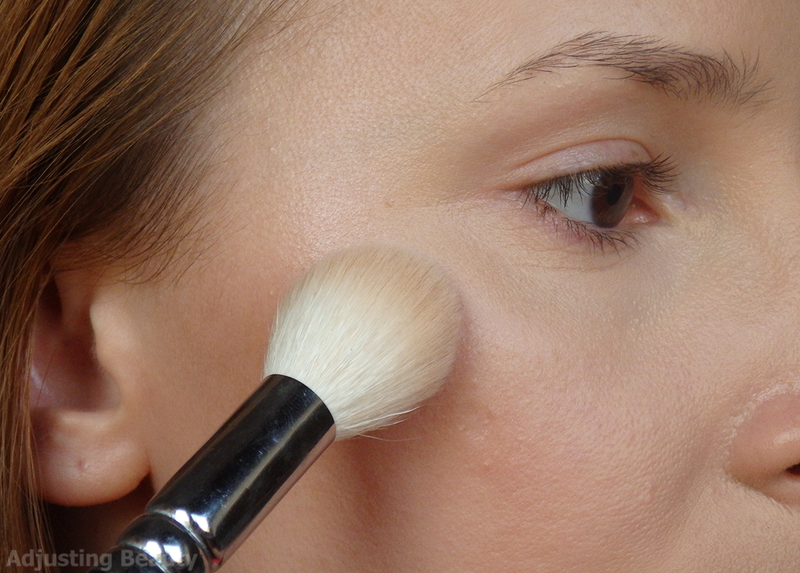 Real Techniques Blush Brush is too big for my liking to be used as a blush brush, but sometimes I like it. 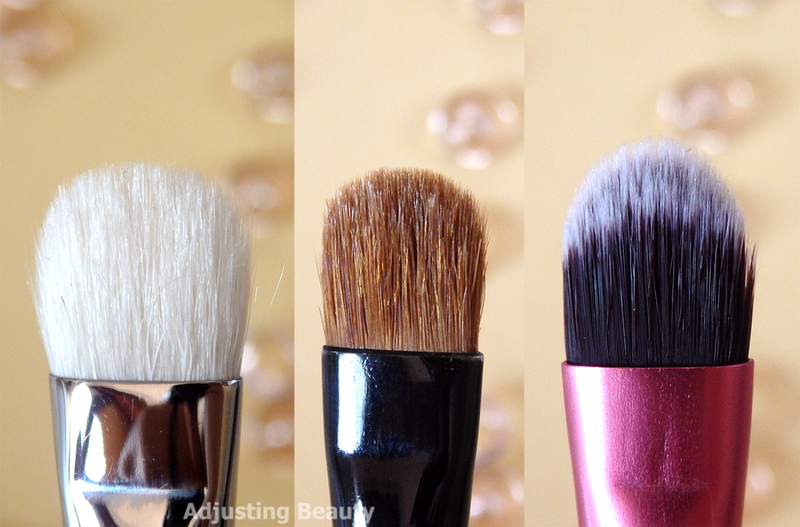 I like the fact that it has tapered bristles, which are really soft and fluffy. This means you can apply blush in a larger area and blend it perfectly. 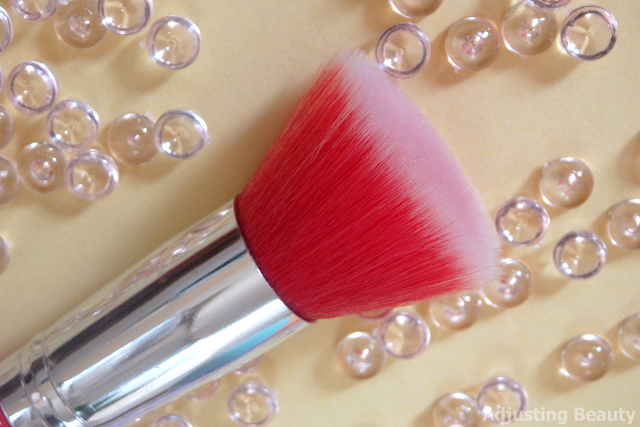 I use just the tip of it to dip into the blush and then let the brush do its magic. It's perfect for those pretty romantic rounded cheeks looks. I'm still looking for a perfect highlighter brush. I have a few and they each apply highlighter differently. I choose them depending on highlighter. 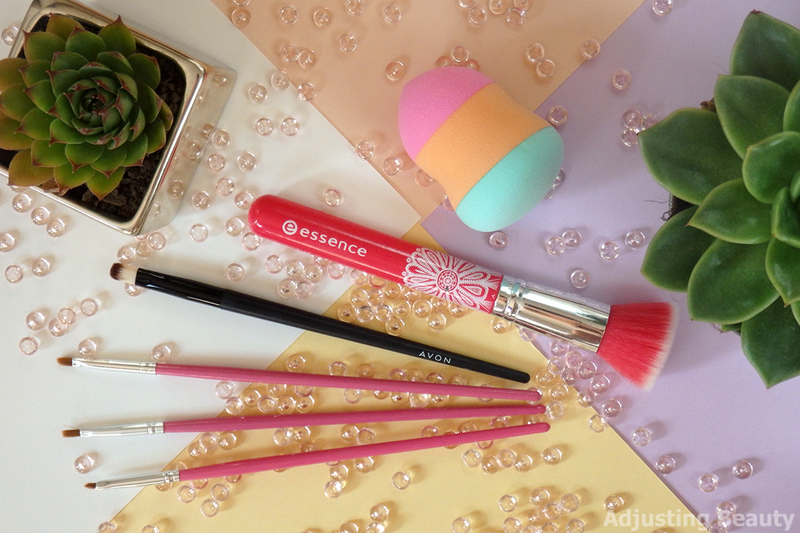 Essence Fan Brush has a fan shape and is really thin. Bristles are soft, but not dense enough in my opinion. This is good for if you want a really bold highlighter look. It picks up a lot of powder and applies it fairly heavily. I also find it best for very finely milled highlighters, because it can make highlighter look too glittery. I feel like it picks up all the glitter from highlighter and applies it heavily. That's why I like to use it with more subtle highlighters or for when I want a really heavy look. E.l.f. Small Tapered Brush is one of my favorite highlighter brushes. It's small enough to fit exactly in that highlighter spot and it's tapered which means it blends out the product nicely. The bristles are soft, but pretty dense. You can apply it very sheer or build it up. I love it for the size, because it's perfect for all those smaller parts like at the top of the brow, center of nose bridge and Cupid's bow. 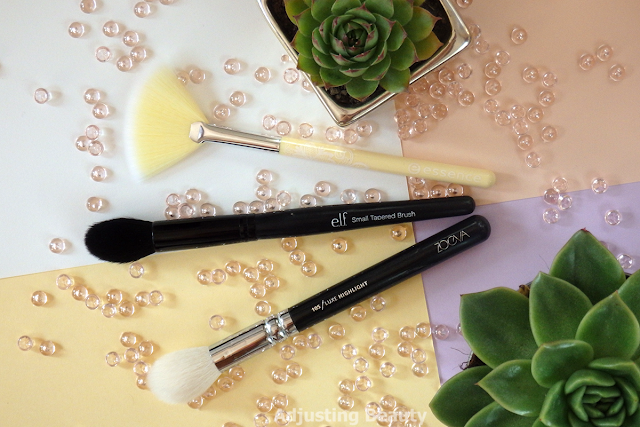 Zoeva 105 Luxe Highlight Brush is a bit bigger, but still fits perfectly on the cheek bone. It has tapered shape, soft bristles and it can provide a sheer or stronger application. I really like how soft the bristles are and it's one of those brushes that I love to use with really strong highlighters, because it doesn't pick up too much product. Contouring is not that popular anymore and I tend to use it less too. But I do like it for certain looks, especially for colder months to add some definition. Currently I have two favorite brushes for that. 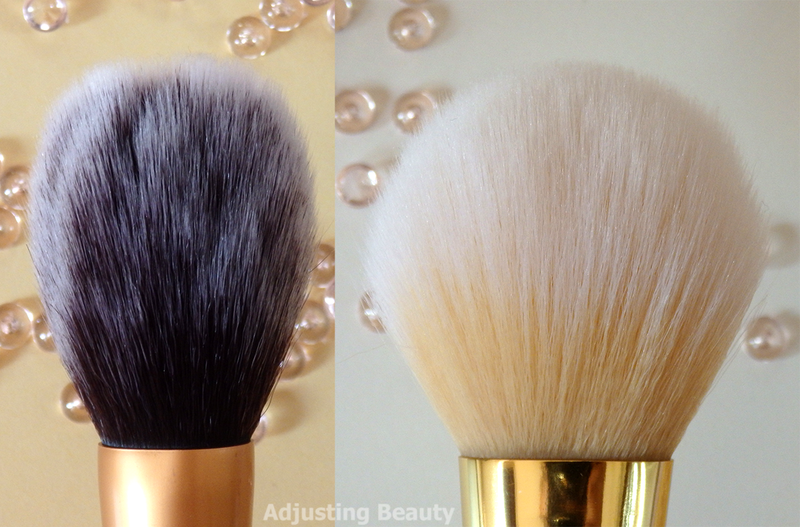 Essence LE Make Me Pretty Powder & Highlight Brush has almost a fan like brush and it's tapered. It's just wide enough to apply a soft haze of contour. Soft bristles make the application really light, but still defined. I love it for a softer contour look. 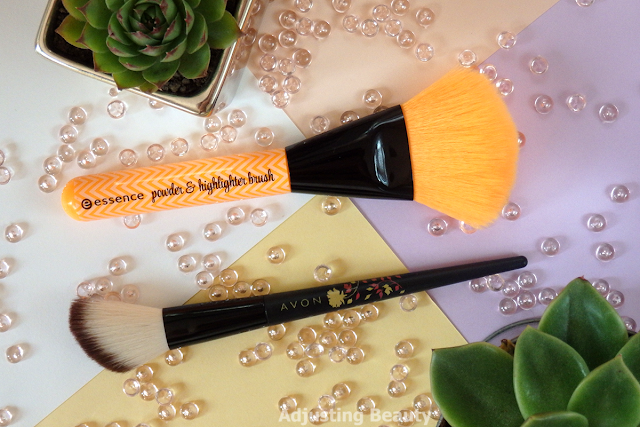 Avon Angled Face Brush is a smaller precise contour brush. It has an angled shape to it, which means it does all the work for you. This creates perfect blend from ear down to mouth. It has soft bristles and because of that it can still look subtle enough. 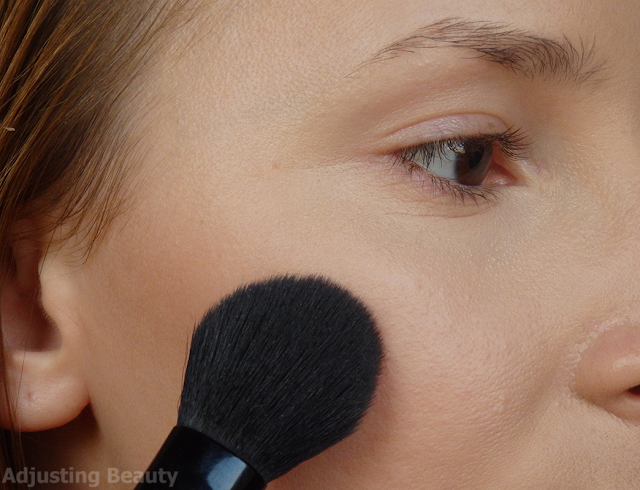 You can build it up to a really intense contour. I love the shape of it, especially when I'm in the rush, because it really does it all itself. I call these base brushes, because I use them to lay down a base color. It's either eye shadow primer, bone colored shade or just one eye shadow look. 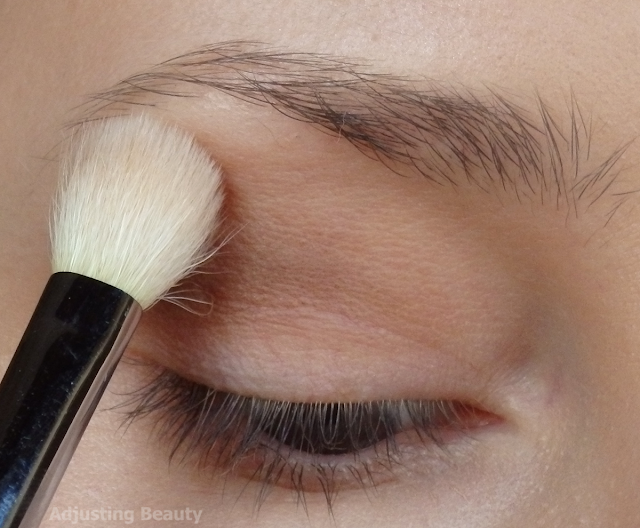 Ebay Eye Brush is a basic wide, rounded and dense brush. I use it to lay down eye shadow primer. It provides a soft blend and is perfect for any kind of cream products. I also love to use it with cream eye shadows that come in pots. Zoeva 227 Soft Definer Vegan is perfect to use when you want to apply just one powder eye shadow all over the lid. Because of its tapered rounded shape and fluffy soft bristles is perfect for applying a light wash of shade all over the lid. This is like a small blending brush and it blends eye shadow perfectly. Ebelin Blending Brush is longer tapered brush that I love to use as a bone colored eye shadow base. I always apply some sort of matte shade as a base before going in with other shades. Since this brush has longer fluffy bristles, I love to use it for that, because I can lightly cover entire lid. 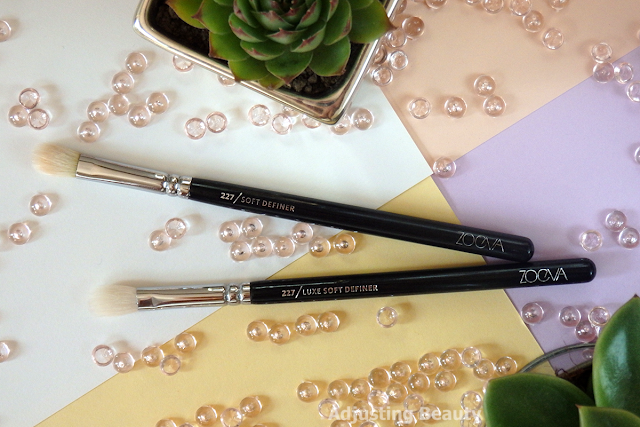 Zoeva 227 Luxe Soft Definer is my ultimate blending brush. I don't like too big and overly fluffy brushes, because I want my blending to be precise and not all over the lid mixing together all the shades. This is just fluffy enough, a bit tapered and rounded and blends lovely. I have two of these and want five more. 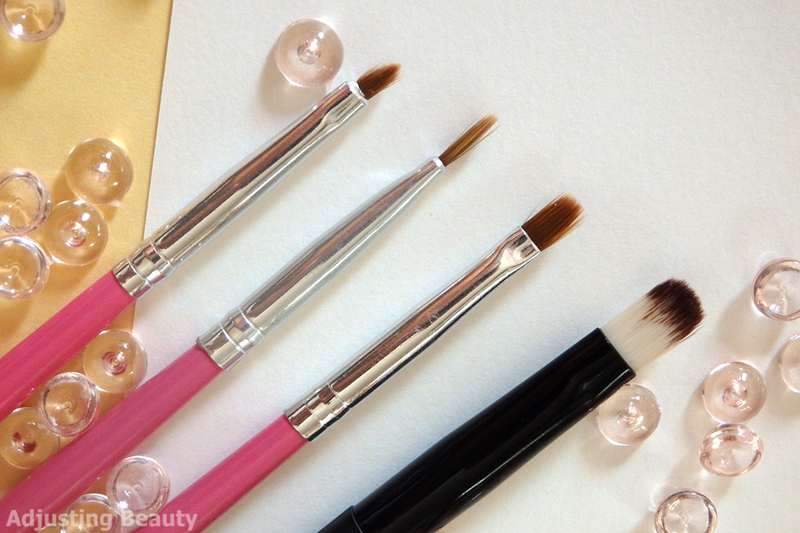 It's one of the most versatile eye brushes. Almost all my makeup looks include some sort of crease shade. 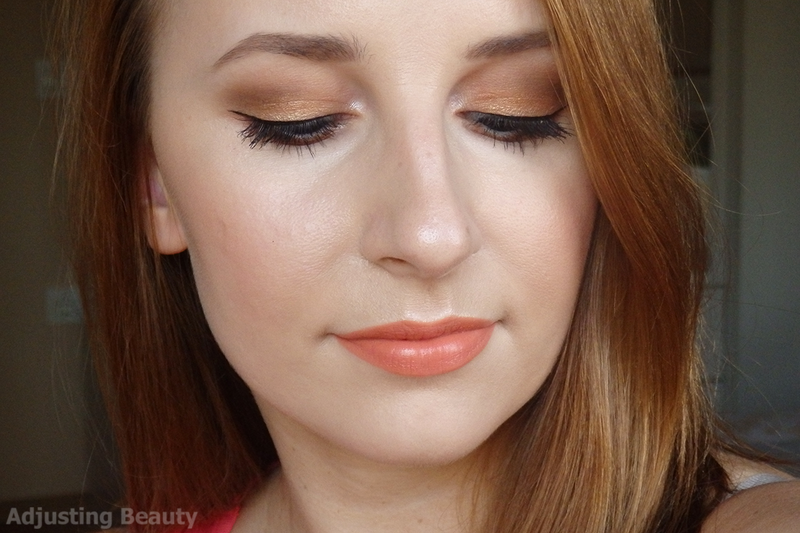 I love to define my crease, because it makes my eye a bit more defined and not as flat. It's also perfect for blending out other shades. I have three brushes that I use for the crease. 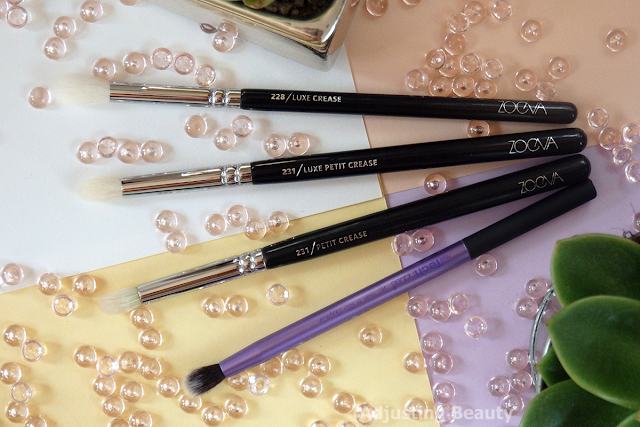 Zoeva 231 Luxe Petite Crease was my favorite crease brush, before I got 228. 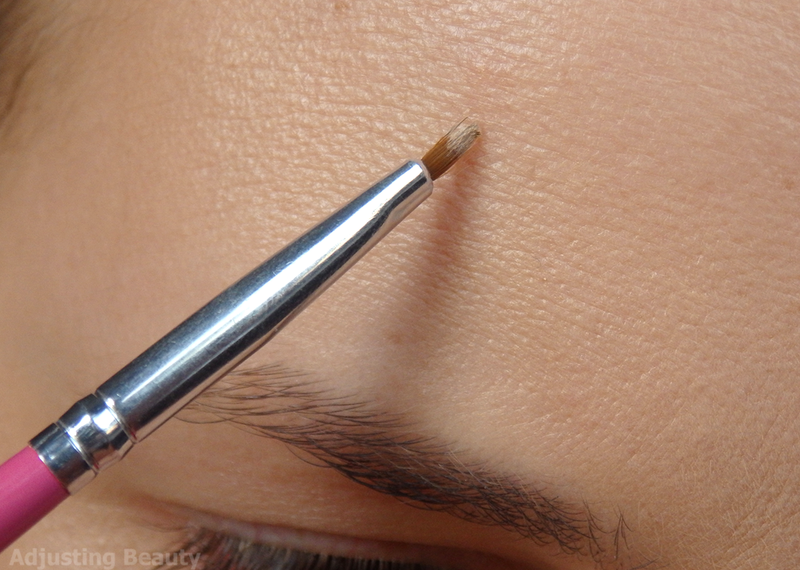 It's a lot smaller, shorter, tapered and makes for a really precise crease application. It blends eye shadow really well and gives you that light, but still defined, crease. I usually use light brown with 228 and then go in with darker brown with 231. 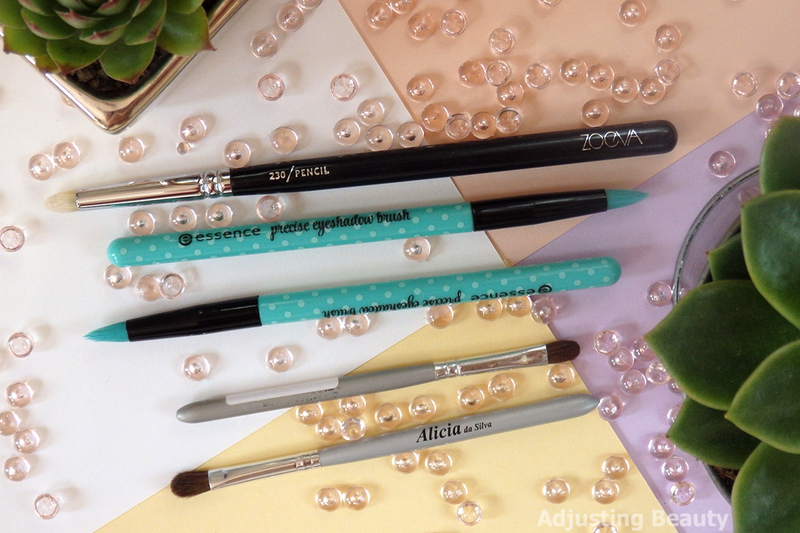 Real Techniques Essential Crease Brush is about the same size as Zoeva 231, but not as fluffy. It's a bit more dense and the bristle aren't nearly as soft. It's just slightly tapered and I love to use this for really precise cut creases. This applies eye shadow really densely and boldly. I rarely use it, just for when I am doing some really strong eye looks. I like flat shader brushes for a lid. You can never have too many of these, because you may want to apply more shades or use some detailed ones for center of the lid and such. Zoeva 234 Luxe Smoky Shade is my favorite lid size flat brush. It fits my lid perfectly. You just pick up some shade and drag it from the inner corner to the outside and you're done. I already have two of these, because I love them so much. 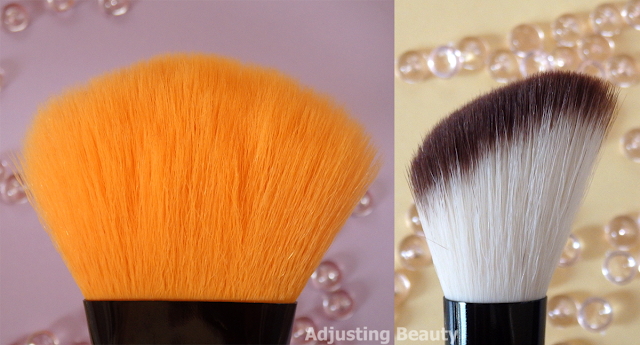 Ebay Lid Brush is similar to previous one, but it's smaller and rounded. This is again good for applying shades on the lid. Because it's smaller you can do a bit more precise application. Flat brush, which has no name and I have no idea where's from, is just another flat shader brush. I love these for everything - powder, cream eye shadows or glitters. I call these brushes my detail brushes. These are for those little small corners where you want to precisely apply eye shadow, glitter, highlighter, whatever. Zoeva 230 Pencil is my favorite brush for highlighting inner corners of the eye. It fits perfectly into that small corner and has a tapered pointy shape. It blends it out, but not too much, and is perfect shape for the inner corners in general. It's a bit scratchy for my liking, but I usually just press it on gently, so it's not a problem. 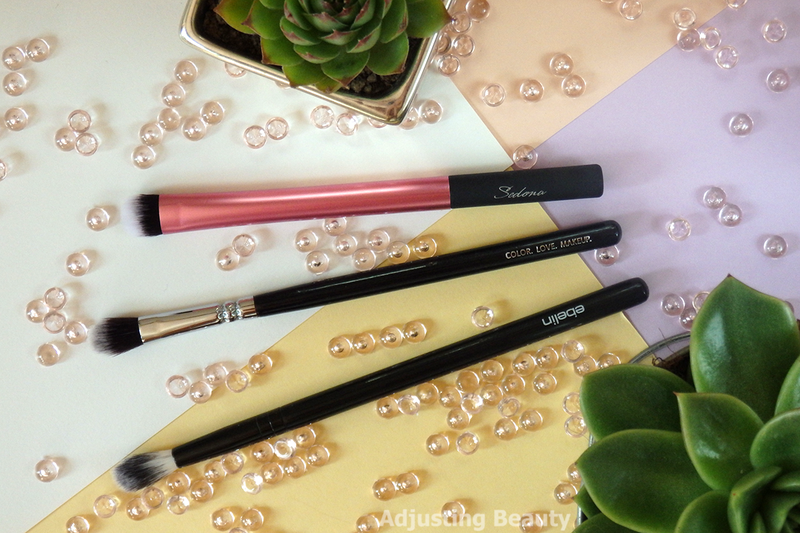 Essence LE Make Me Pretty Precise Eyeshadow Brush is extremely pointed tapered brush. It's perfect for a really precise application, like under the lower lash line, inner corners and such. I love to apply shimmer shades on the center around the lower lash line with it. It has soft and really dense bristles, but you can still blend out the product with it. Alicia da Silva Eye Brush (sorry, I don't know the actual name of this shape of brush) is a really small soft rounded brush. It almost looks like those flat brushes, but is a bit fluffier and not as dense. This is great for really precise eye shadow applications on the lid, or just the center of the lid, or under lower lash line and such. I usually use this when I apply a lot of different eye shadow to my lid. I like different shapes of brushes for my lower lid, because I want them to do different things. For the longest time I didn't have a good brush for that part of the eye, but I've found my favorites now. 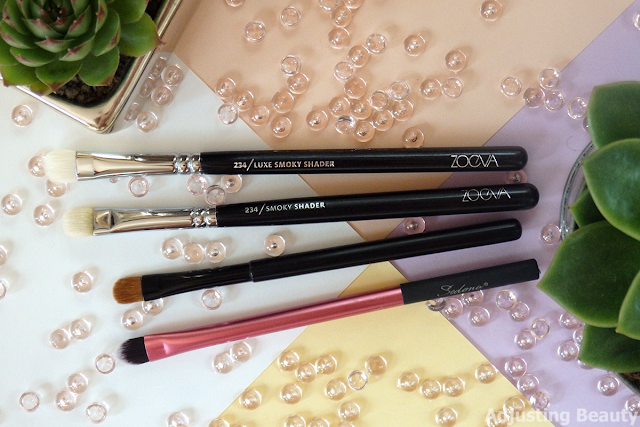 Zoeva 226 Smudger is my favorite lower lash line brush. It's flat, short and has really dense soft bristles. This quickly lays down any shade all around the lower lash line. You can keep it really close to the lashes or drag it further down. Ebelin Precision Lid Brush I use for applying darker shades really close to the lower lash line. With this rounded pointed brush you can get a really bold color payoff. I also like to smudge eyeliner with this one, because it has really dense bristles. It's basically like a very dense pencil brush. 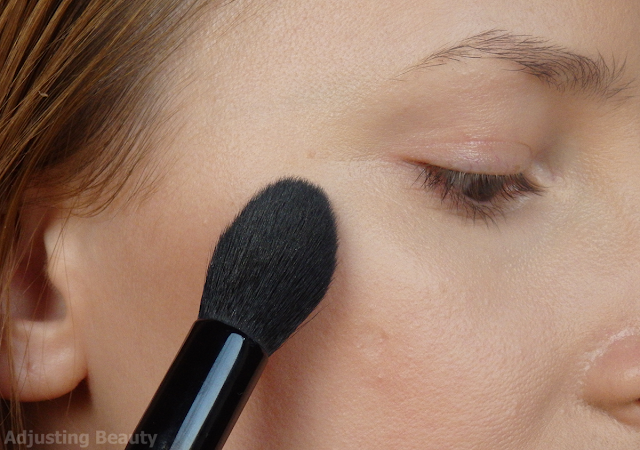 Essence Smokey Eye Brush is rounded, soft, short brush. This one I use for applying a really subtle haze of shade on my lower lid. 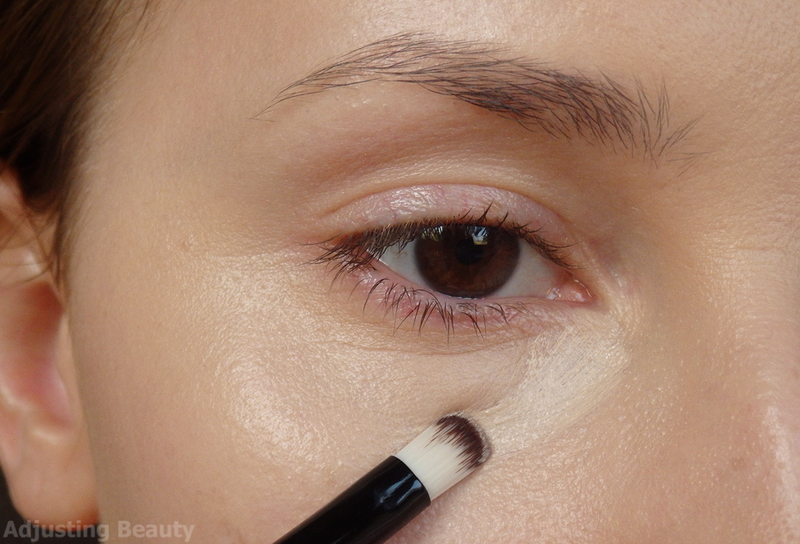 It's also great for smudging or just pulling shades lower down and creating a bit softer look. I like to blend lower lash line with it, because the bristles are soft enough and not as dense. One of the hardest brushes to find is eyeliner brush. I am really picky about it and still haven't found perfect eyeliner brush. I mostly use felt tip and brush liner anyway, but sometimes I still like to apply black eye shadow as an eyeliner or use colorful gel liners. 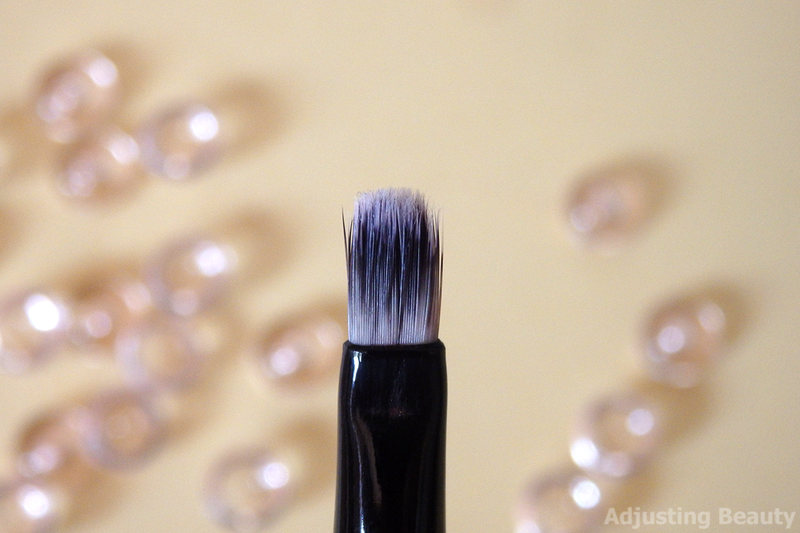 Ebay Metallic Liner Brush is narrow angled brush. It has really soft bristles and they are fairly dense. I love to use this one to smudge pencil liners. Because it's narrow and has an angle I can create a short wing with it. Sometimes I also use it to apply eye shadow on the lower lid. Zoeva 317 Wing Liner is a bit wider and bigger angled liner brush. Bristles are very soft and dense. I love to apply eye shadow liners with it. It creates a perfect wing and is dense enough to pick up eye shadow. Nail Brush (angled) is yet another nail brush that I love to use as an eyeliner brush. This is my favorite angled liner brush, because it's the smallest, narrowest and has dense enough bristles. It's perfect for applying gel eyeliner. I love the fact that is short, because it's really precise. Those usually winged brushes are too big for my liking and I don't have enough control with them. 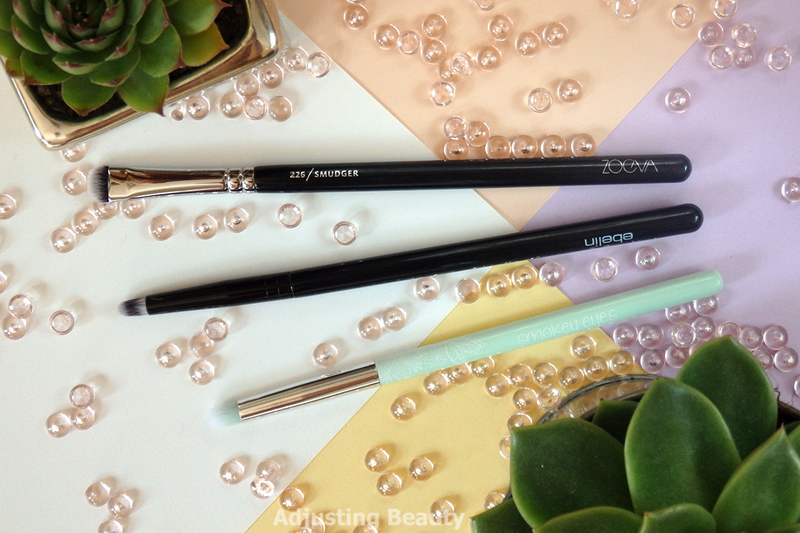 Zoeva 315 Fine Liner is a regular liner brush. It's long, pointy and fairly thin. For my personal liking this is still too wide. If I'm doing a gel liner, I want inner corners to be really thin and you just can't do that with this one. 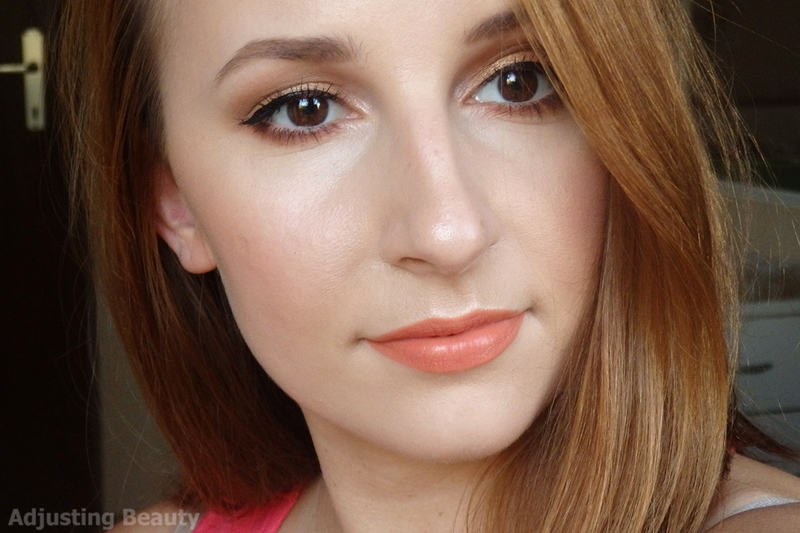 It is great for a bolder liner looks. Nail Brush (liner) is again a brush from a nail kit. 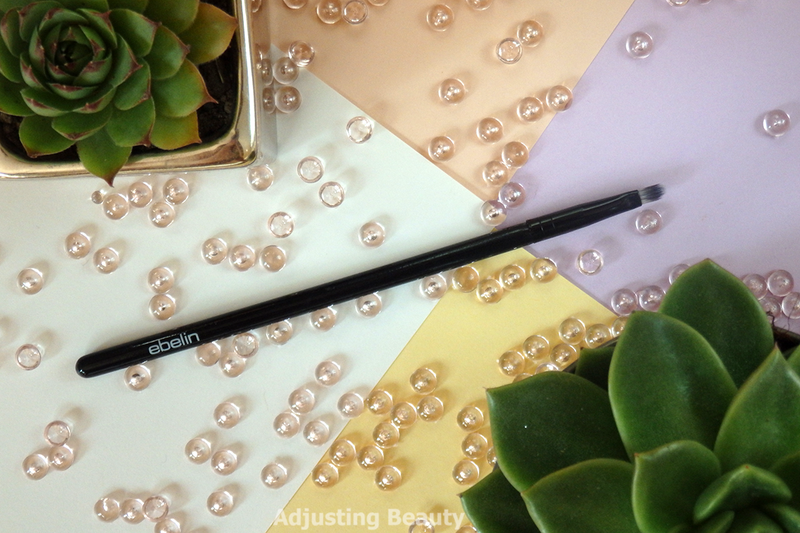 This is my favorite liner brush for creating precise and very thin gel eyeliner. It looks really beaten and old, but once you dip it into the cream it becomes really thin and precise again. I love it, because it's so small and the thinnest brushes ever. I wish makeup brands would finally started making really thin liner brushes, because not everyone has a tone of space on the lid and I don't want to close up my eyes even more. Ebelin Lip Brush is my favorite lip brush. I like my lip brushes to be squared and straight cut off. 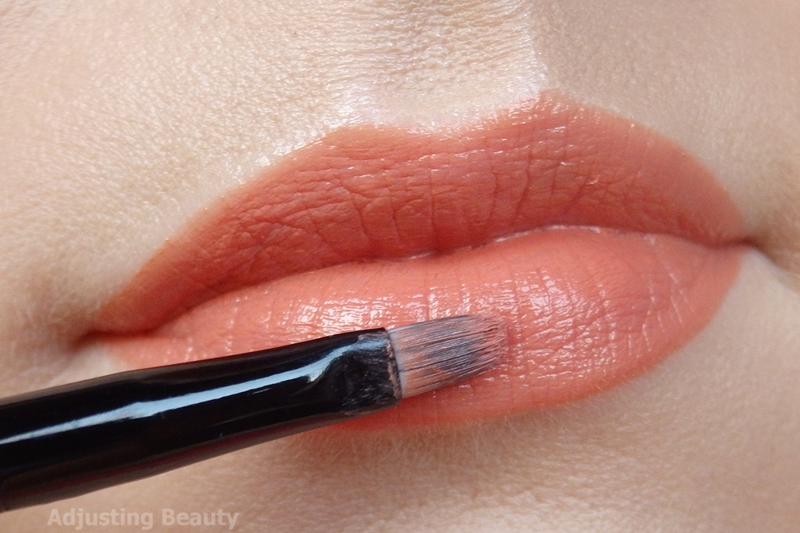 This gives a precise application around the edges of the lips. It's hard to create really straight lines with rounded brushes. I also don't like too wide or too narrow brushes and this one is just perfect. Bristles are soft and dense enough. That is my finishes result. It's my usual makeup look that I created using most of these brushes that I talked about. My favorite brand for eye brushes is Zoeva. In my experience all their eye brushes with white bristles are extremly soft. They don't shed at all and stay in shape. I've had some discoloration with some white brushes and strong pigmented shades, but that's a given. I also love a lot of those nail kit brushes, because they are really precise and still soft enough. 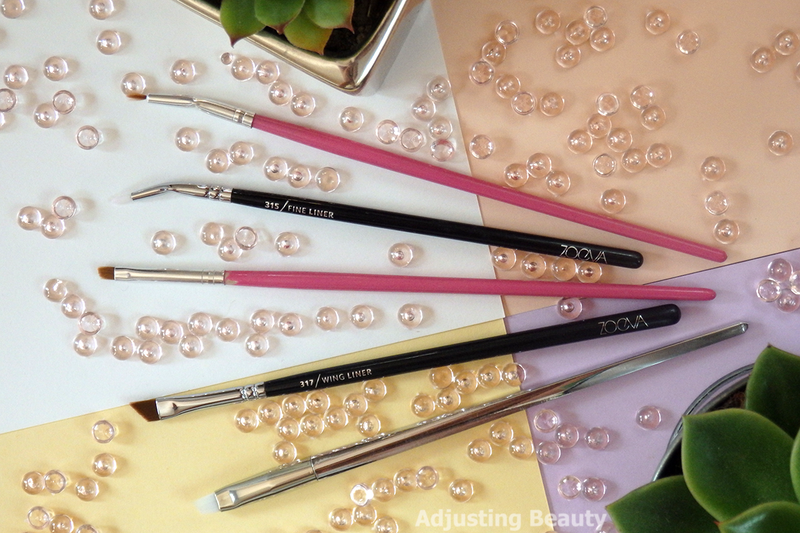 They are mostly for precise work and are in fact thinner than most makeup brushes. Ebelin and Essence also make some great eye brushes. Especially Essence brushes are all really soft. 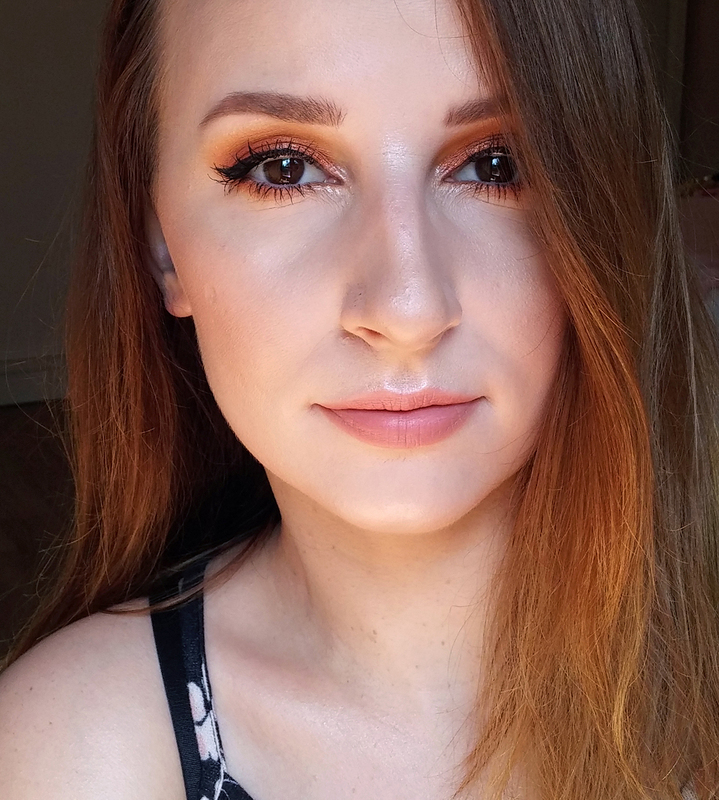 They don't have as much shapes as professional brands, but are good for a basic makeup look. I have a lot of different brands for face brushes. E.l.f. 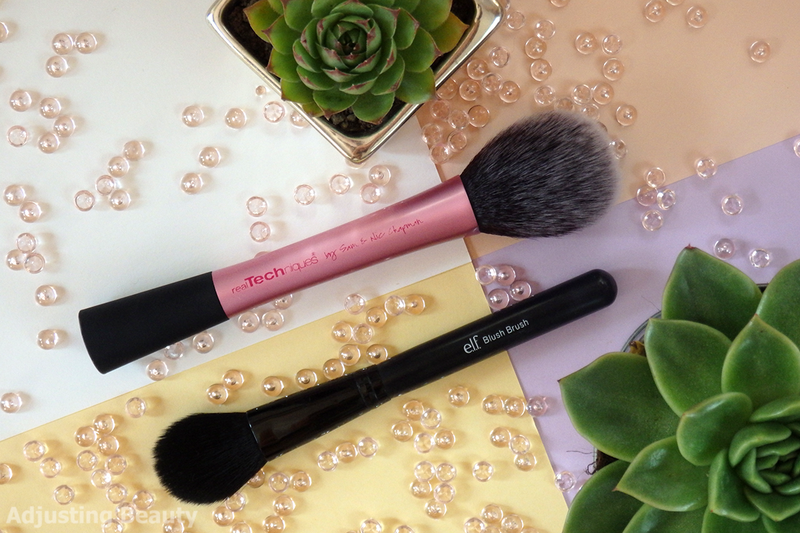 Blush Brush is an absolute must have. I don't like their eye brushes, because they're not soft enough for my liking. 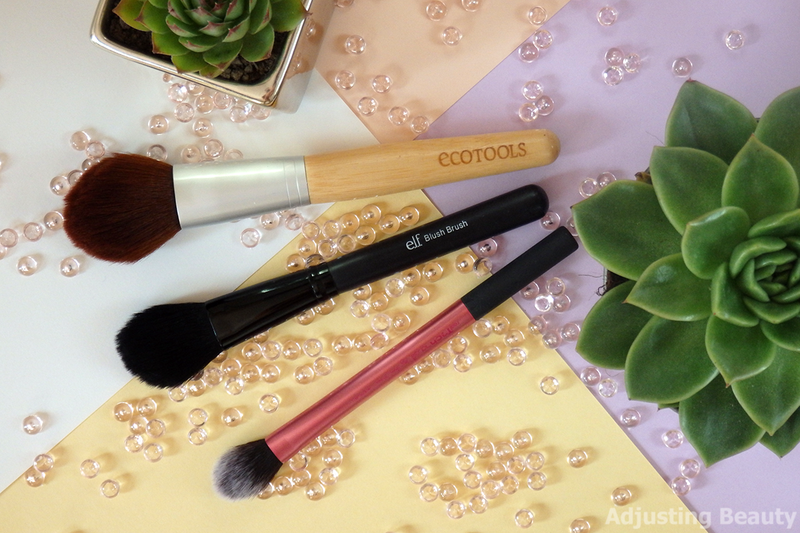 Ecotools does nothing wrong when it comes to face brushes. They have one of the softest bristles and are in general very well made. Real Techniques is also a very popular brand, but from what I've tried I only like Blush Brush and Setting Brush. Avon is another brand that has a very small range of makeup brushes, but the ones I've tried are great. Extremely soft bristles and well made. Ebay is known for having a lot of famous rush brands cheaper alternatives. I'd say go with those sellers that someone has already recommended. You may find 8 sellers that sell metallic brushes, but not all of them are going to be the same quality. I'm sure my collection is tiny compared to makeup artist collections, but also too big for a regular makeup user. Makeup brushes are essential in creating good makeup and I highly recommend you to invest in good ones. That doesn't mean they have to be expensive, because you can get really good affordable brushes as well. Do your research or just trust my word on those that I've shown you in today's post. 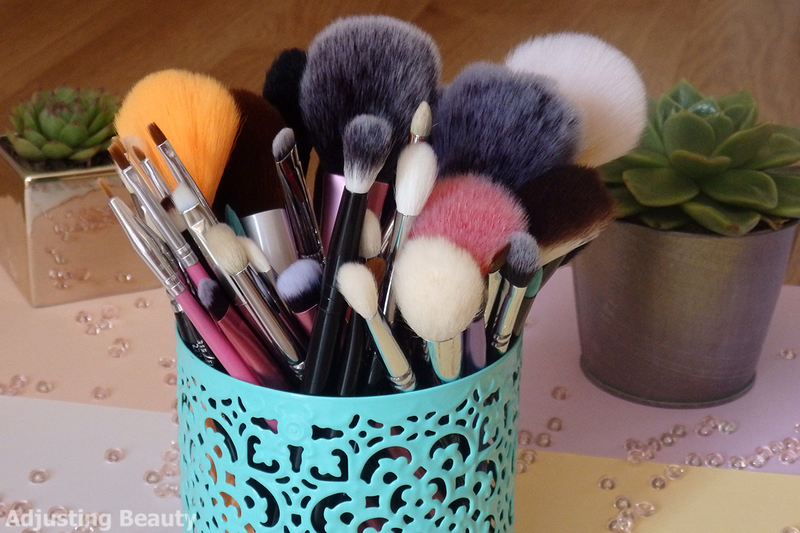 I'd love to know what are your favorite makeup brushes brands and why? You can also tell me how much brushes do you have? I'm really curious about that. Hvala :) Hehe :D Se vidi, da imam rada te fluffy zadeve :). Odlična objava, se vidi, da ti je vzela kar nekaj časa :) Se strinjam s tabo - dokler nimaš enih spodobnih čopičev, ni noben mejkap pravi. Kar nekaj čopičev imava enakih, ampak jih presentljivo ne uporabljava za iste stvari - Ecotools blush brush imam samo za blushe, moj pravi RT Blush brush in zlat eBay powder brush sta za puder v prahu, Zoeva 228 imam za blendat in Essence Smokey Eye Brush za crease. Zdaj mi žal da sem zamudila par Essence čopičev, npr. Bloom me up blush brush in make me pretty powder & highlight, čeprav vem zakaj sem se jih izognila, ker ne zaupam Essence plastični kvaliteti. Hvala :) Točno tako. To vsak ugotovi, ko dobi kakšne malo bolj dostojne čopiče :). Hehe pa res čisto drugače. Zoeva 228 je komot za blendat. Ampak meni nekako paše v crease, ker ni tako natančen in imam rada dlje do obrvi blendana senčila. Meni so občasno všeč Essencovi čopiči. Zmagajo mi predvsem, ker so dovolj mehki. Kvaliteta sicer ni neka vzdržljiva, ampak za ceno so dobri. Zoeva meni tudi zmaga za oči, za obraz so mi pa predragi zaenkrat. Mogoče pa kdaj :). A saj potem imaš kar zbirko. Jaz imam mogoče še enkrat toliko kot v objavi, ampak tiste ene skoraj nikoli ne rabim -slabe odločitve pri nakupu, kakšni izredno stari in podobno. No super ;). Kvantiteta itak ni pomembna. Sem ti pa verjetno dala kakšne ideje tudi za cenovno ugodne nakupe. Sploh Ebay je včasih odličen. Mislim, da so Jessup čopiči iz Ebaya izredno hvaljeni in zelo poceni ;). Hvala :) <3 Šminka je pa Avon 3D Plumping odtenek Cantaloupe. Meni en najljubših. Tak umazan peachy :D.